How much does it cost to travel to Manila? How much money will you need in Manila? ₱3,588 ($69) is the average daily price for traveling in Manila. The average price of food for one day is ₱358 ($6.93). The average price of a hotel for a couple is ₱5,154 ($100). Additional pricing is in the table below. These average travel prices have been collected from other travelers to help you plan your own travel budget. A sprawling metropolis that is home to more than 12 million people, Manila is one huge, misunderstood concrete jungle, full of diverse cultures, traffic, pollution, restaurants, shopping malls, noise and nightlife. If you're looking to soak in culture and feel the vibe of a place rather than seeking a city that specifically caters to tourists, Manila is the place to be. 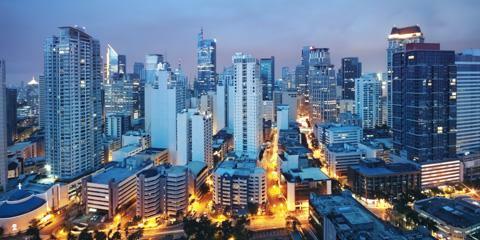 Capital of the Philippines, Manila is also the center for education, business, and transportation. The Philippines has tropical climate with plenty of heat and humidity throughout the day. Wet season starts in May and lasts through October while dry season is from November to April. While wet season doesn't always bring torrential rains, the best time to visit is during dry season, in the months of January and February, which are the coolest months of the year with highs in the low 80s and minimal rainfall. The main tourist area is Intramuros, which mean "within the walls" in Spanish. Also known as "Old Manila, during Spanish times," here, you can learn about Manila's history. Visit Fort Santiago, the original seat of Spanish military power, San Agustin Church, the only building left standing after Intramuros' destruction in WWII, and the grand Manila Cathedral, a popular site for weddings even today. Nearby, Rizal Park is a green space away from the noise of the city, perfect to stroll and exercise among the locals themselves. South of Intramuros are the neighborhoods of Ermita and Malate are the two official tourist districts, where you can take in a nice view of Manila Bay. After visiting both historical Ermita and Malate churches, head toward Remedios Circle for a great selection of restaurants and bars. In Ermita, families may enjoy a visit to Manila Ocean Park, an aquarium comparable to Singapore's Sentosa Aquarium, the Artist's Garden, and the Planetarium. South of Ermita, Malate offers the oldest zoo in Asia, the Manila Zoo and the historical Rizal Stadium. Roxas Boulevard is a lovely waterfront promenade. In addition to shopping and restaurants, take a stroll down the baywalk and check out the Metropolitan Museum of Manila or buy tickets to a show at the Cultural Center of the Philippines. Manila's Chinatown, located in Santa Cruz and Binondo, is the oldest in the world. Take a walk down Ongpin Street starting at the Goodwill Arches and check out the traditional Chinese shops vending imported herbs, jewelry, and knick-knacks. Don't forget to stop in at one of the many Chinese and Hong Kong restaurants, bakeries, and teahouses. Makati, which is known as the business center in Manila, is also the place to experience Manila's hottest restaurants, happening nightlife, and luxurious hotels. Offering its cosmopolitan lifestyle, a progressive tech domain, ever-changing arts and culture scene, and plethora of international cuisine (not to mention over 40 embassies and consulates located in the area), it's no wonder Makat is the favorite neighborhood among expats. Stop into the Ayala Museum to gain a better understanding of the complicated history of the country. Named one of the best shopping destinations in Asia, Manila has numerous malls and shopping centers for shopaholics and window shoppers alike. Don't be fooled, though - a mall here isn't simply for shopping and eating, but offers everything you might possibly want, whether you want to get a facial and massage in a salon, make a wager on a game of bingo, attend mass at church, or even visit the doctor. Some of the most popular malls include the Mall of Asia in Pasay, the Megamall at Ortigas Center, the fancy Glorietta mall in the ever-lux neighborhood of Makati, and the lower-priced Trinoma in Quezon City. While Manila has plenty in the way of international restaurants, don't forget to try some of the local foods of the city. Chicken Adobo is a classic and famous Filipino dish, made of chicken marinated in soy sauce, vinegar, garlic, and pepper, served alongside rice. Try it at The Aristocrat, located on the corner San Andres Street and Roxas Boulevard. Another popular street snack is Balut, which is 17-day old duck embryo, which you can find at stalls on the street. Balut vendors come out at night and you can find many in the city center near San Roque Church. If you want to stay near the nightlife, walk around the intersection of Makati Avenue and Jupiter Street. Kare Kare, which is oxtail stew made of oxtail, vegetables, onions, peanuts, and garlic, is another Filipino speciality. Visit Barrio Fiesta to try this, along with Crispy pata, deep-fried pork knuckles, and lumpiang ubod, which are palm hearts, shrimp and pork wrapped into a spring roll. Save room for dessert! Halo Halo mixes shaved ice with evaporated milk and topped with agar jelly, sago, sweet beans, and fruit. Try it at Raxon's SM Manila or if you're on the go, stop into a Jollibee or Max's for a Halo Halo to go. Last but not least, don't forget to the Philippines' world-renowned Tanduay Rhum, the most popular rum right after Bacardi. Fly directly into Ninoy Aquino International Airport in Manila from almost any major city in Asia. Cebu Pacific is a well known low-cost airline offering flights on the daily. However, beware that this airport has a poor reputation because it is not well-connected among its own terminals. This means that you'll need to give yourself plenty of cushion time if you're taking a connecting flight. Note that there is now a free bus transfer service that stays within the airport from Terminal 4, used for budget airlines, to Terminal 1, which is used for most international flights. Clark Airport is two hours north of the city and has direct buses into the center. You can also get into Manila by boat. Many ferries which serve other major cities in the Philippines dock at Manila South Harbor. Provincial buses also serve Manila and the stations are located throughout the city, depending on the destination. Go to Sampaloc District to find buses headed north and to the EDSA (a limited-access freeway around Manila) and South Superhighway junction if you're headed south. To get into the city, you can take a taxi. Note that all airport metered taxis are yellow in color. However, scams are common using accelerated meters, so watch the meter. You can also ask the dispatcher in advance how much a ride to your destination should cost to get an idea of the normal fare before getting in. Outside of taxis, you can also opt to take a bus or a jeepney, which is a smaller bus originally made up of leftover WWII U.S. military jeeps. Jeepneys are the most popular form of transport for locals and inexpensive. However, they are open-air vehicles without air conditioning and can get very crowded, so beware of pickpockets. The kitschy designs painted onto jeepneys contribute to a huge part of Filipino culture and art. You can often determine the destination of a jeepney or a bus by reading the locations painted onto the outside of the vehicle or on the dashboard. If all else fails, ask a helpful local. If you need to get to a place that is difficult to access in a larger vehicle, opt for a tricycle, or a Filipino rickshaw. These vehicles cover short distances and should provide a table of fares. Negotiate longer distances with the driver before boarding. You can also take a calesa or a horse-drawn carriage to get through narrow streets, but similar to negotiating the cost for a rickshaw, be sure you agree on a fare before getting in. If you're looking to escape the city, try a weekend in Antipolo.